in 1985 by then Governor S. K Bhatnagar. Mr. Nar Bahadur Bhandari was born on 5th October 1940 at Malbasey Village, Soreng in West Sikkim. Born into a peasant family of late Balaram Bhandari, and Late Chandra Maya Bhandari, Mr. N. B Bhandari was the youngest child. Amid poverty, he had his early education at Soreng and accomplished his High School from Namchi. After completing his high School he went to Government College Darjeeling to complete his Graduation. As a student he took keen interest in Students’ and youths’ welfare and engaged himself in various social and literary activities. He joined Sikkim Government Service as a teacher at Soreng School and later taught at Chakhung School, Rongli Junior High School, Namchi Senior Secondary School and finally at West Point School, Gangtok. After the protest movement of 1973 (that curtailed the unlimited powers of the Royal House) Mr. Bhandari resigned from his service and joined politics. He along with a few like minded associates like late Durga Prasad Rajalim of Namchi then formed the United Independent Front and became its General Secretary. The main agenda of the party was to protect Sikkim from becoming an integral part of the Indian Union. The United Independent Front Party of Mr. Bhandari contested the General Election of 1974 which was held on the basis of Universal Adult Franchise for the first time in the democratic history of Sikkim. His party was badly defeated in this election. 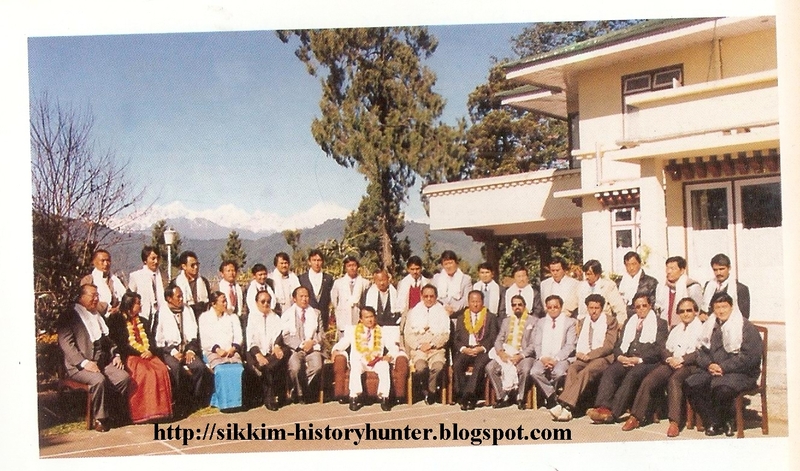 The year 1975, brought a new era in the history of Sikkim. An independent Himalayan Kingdom ruled by an independent monarch became an integral part of Indian Union. A new Sikkim was born on 16th May 1975 converting the Subjects of Sikkim Chogyal into the citizens of India. Mr. Bhandari along with his associates greatly opposed the decision made by the Sikkim Assembly to amalgamate Sikkim into India. Even after the merger, he was opposing the decision made by the Sikkim Assembly to merge Sikkim. Under this alleged reason, he was arrested under Maintenance of Internal Security Act (MISA) and was sent to Behrampur Jail by Kazi Lhendup Dorjee’s Government. He spent one year at Behrampur Jail from 1976 to 1977 and after his release, he formed Sikkim Janata Parishad in October 1977. The Sikkim Janata Parishad took part in the General Election of 1979 and won 16 seats out of 32. With the support of an independent Sangha (Monastic) MLA, Rev. Lachen Gomchen Rimpoche formed his first Government. In May 1984, his Government was dismissed allegedly on ground of corruption charges even having support of the majority in the Assembly. 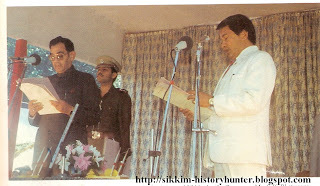 After the dismissal of his Government, Mr. Bhandari formed Sikkim Sangram Parishad and successfully fought the Lok Sabha Election of December 1984. In March 1985, his party contested the Assembly Election under his leadership and came out as victorious by winning 30 out of 32 seats. With this overwhelming victory he became the Chief Minister of Sikkim for the Second time. After becoming the Chief Minister, Mr. Bhandari resigned from his Seat in the Lok Sabha which later went to his wife Mrs. Dil Kumari Bhandari uncontested. His Sikkim Sangram Parishad Party returned to power again in the election of 1989 with a clean sweep. In May 1994, the Government headed by Mr. Nar Bahadur Bhandari lost a vote of confidence in the Sikkim Legislative Assembly which led to his resignation from the Government. This teacher turned politician was deeply interested in reading and writing. He has many publications to his credit that includes the very famous Hamro Pukar (Our Voice) (1963) which was the first complete Nepali literary journal edited by a natural Sikkimese. Further, Mr. Bhandari also edited Aaja Ko Sikkim (Today’s Sikkim) a bi-weekly and a Nepali literary journal Archana (1973). He has also written Tuhuro ka Bichar Haru (Thoughts of an Orphan) 1988 another remarkable literary work of him is Nar Bahadur Bhandari ka Kehi Rachana Haru (Few Writings of Nar Bahadur Bhandari). For a long time he was the President of Bharatiya Nepali Rastriya Parishad which played an imperative part for the inclusion of Nepali Language in the VIII Schedule of the Indian Constitution. Apart from a literary figure and politician, Mr. Bhandari is a keen lover of sports particularly Football, Volleyball and Badminton and he is one of the best orators in Nepali speaking world. Due to his indefatigable efforts Nepali language received Constitutional Recognition on 20th August 1992. Even today at the age of 71, Mr. Bhandari is still active in the politics of Sikkim.